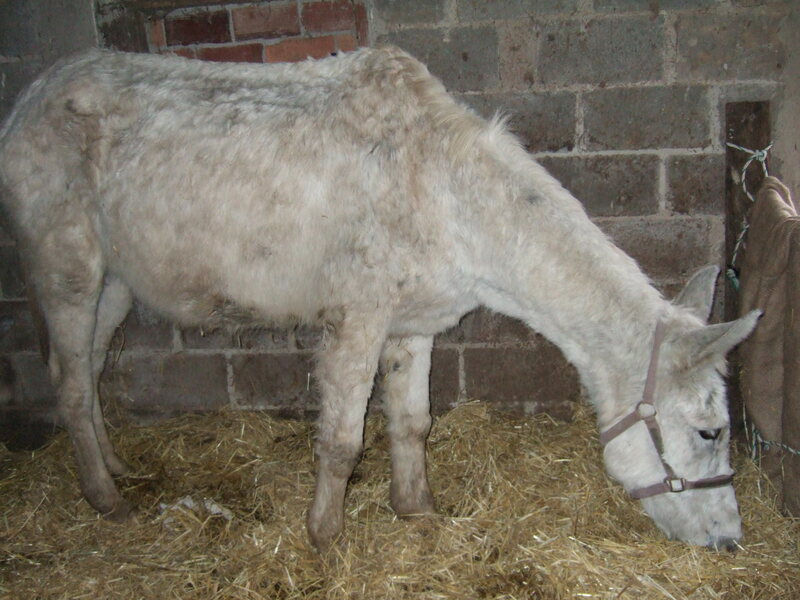 Lynney is a quiet and friendly donkey, a little overweight but very beautiful. With a good diet and some fresh carrots and apples she will soon become an ideal weight. She loves a cuddle and spends her time peacefully grazing. The friendliest of all the donkeys, she has wonderful pink lips. 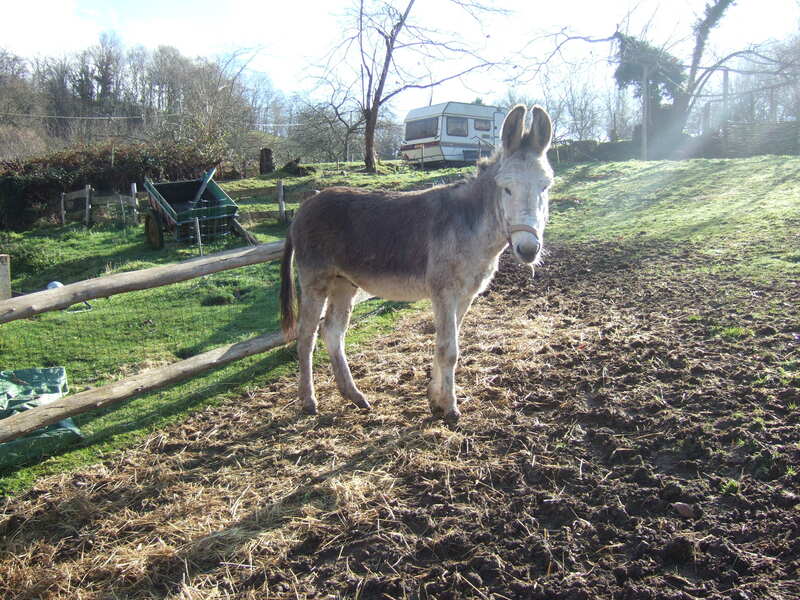 Samy is a small, dark grey donkey with rather nice markings on his back in the shape of a cross. He is a very busy little fellow and doesn’t stand still for long as he always wants to follow the other donkeys and see what they are doing. He is also rather cheeky. Yonas has been at the Paraiso for a few weeks now and was extremely excited when he first met the other donkeys and he chased them around the field, particularly the females. 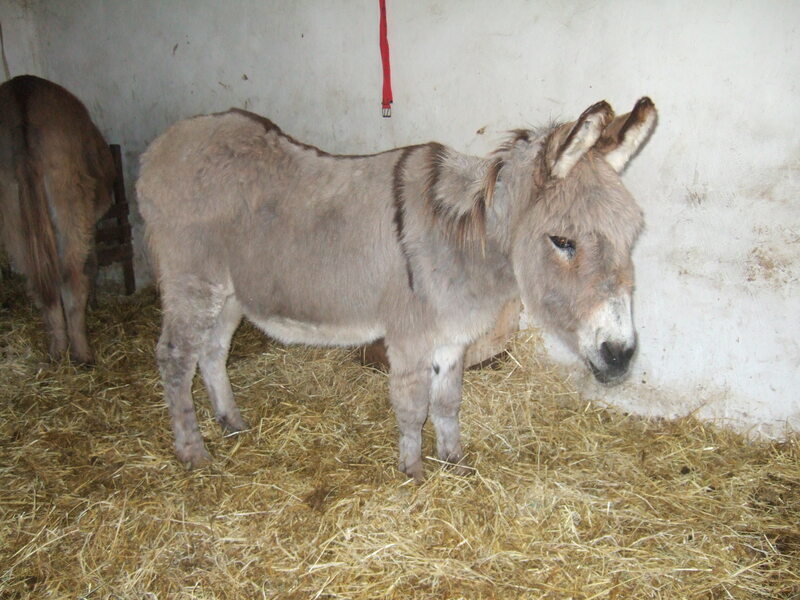 He is quite a young donkey, about six years of age, and of course he has a lot of energy. He is the most dominant of the donkeys. 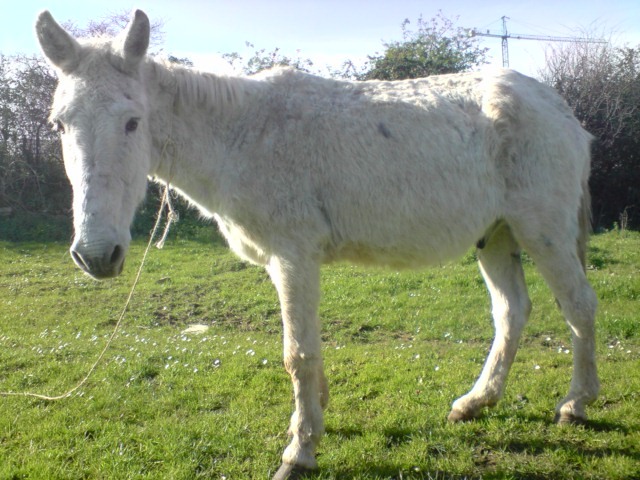 The newest arrival is Pablo and he is a big, white mule with the most beautiful eyes. At the moment he has his own stable as he is very frightened of both people and the other animals. 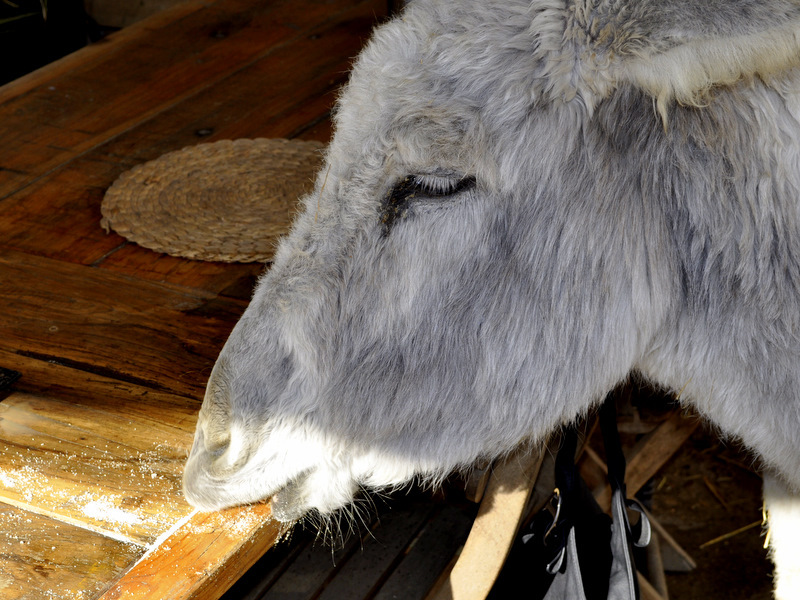 Given time, care and patience he should soon integrate with the human and animal community at El Paraíso del Burro. Read his story in the blog before this one. 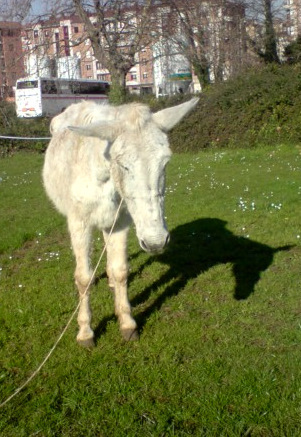 For the past six year, a large grey-coated mule (age unknown) has regularly been seen grazing on a plot of land near Gijon. 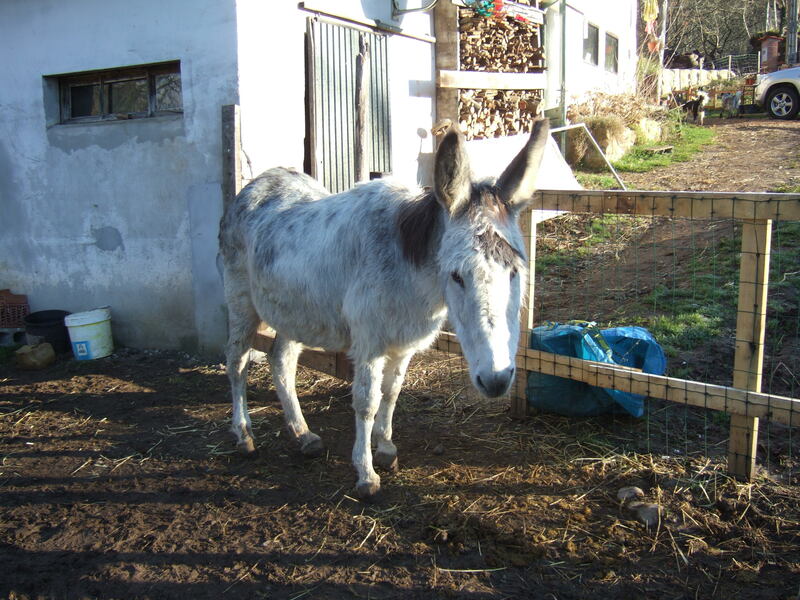 Recently, some friends of El Paraiso del burro, who help out at the dog sanctuary in Infiesto, noticed that for about two months, the mule did not appear to have been cared for. He was beginning to look neglected and in poor health. He was without shelter, food and water, tethered to a tree and covered in parasites. It was clear that he has either been abandoned or his owner can no longer care for him. The helpers from the Dog sanctuary managed to take him food and water but their concerns would not go away. Following discussions with the local police, it was agreed that he should be relocated to El Paraiso del Burro. The policemen even came along to see him off to his new home. Oh and bye the way, we have called him Pablo. Welcome to El Paraiso del Burro Pablo. The open day on 6th February was a great success. With a steady trickle of visitors, it was great to see Marleen doing what she does best…talking about donkeys! Her passion and caring approach to the donkeys in her charge is infectious and the visitors soon realise that there is more to these creatures than first meets the eye. I hear on the grapevine that a few more volunteers were recruited from the open day so that was great news. With Juliette’s already damaged spine and hips, it is kinder on her to remove her from the situation when we might be otherwise distracted. Talking of which… Whilst we were distracted and busy talking to the visitors, the sound of broken pottery and falling teaspoons were heard. Never one to miss an opportunity, Juliette had helped herself to the sugar bowl and a few cups of coffee and tea dregs. Fortunately, the lovely plate of biscuits was just out of reach.